One of the most popular, and difficult, New Year’s resolutions is to quit smoking. If your resolution for 2015 is to give up tobacco, arm yourself with knowledge to give yourself the best chance of success. It may help you to keep in mind the dangers of smoking. Lung cancer is the most well-known risk, but smoking also carries many, many other risks. Yet another study found a connection between smoking and chronic pain. By conducting brain scans, they found that smoking interferes with connections in the brain, leaving the smoker more vulnerable to chronic pain. This particular study focused specifically on chronic pain in the back. The research team found that smokers are three times more likely than non-smokers to develop chronic back pain. Just as smoking immediately causes damage to the body, quitting smoking can quickly have benefits. Additionally, the respiratory issues associated with smoking can be improved within a matter of weeks. Researchers found that college students aged 18 to 24 experienced less respiratory symptoms, particularly coughing, as little as two weeks after they stopped smoking. 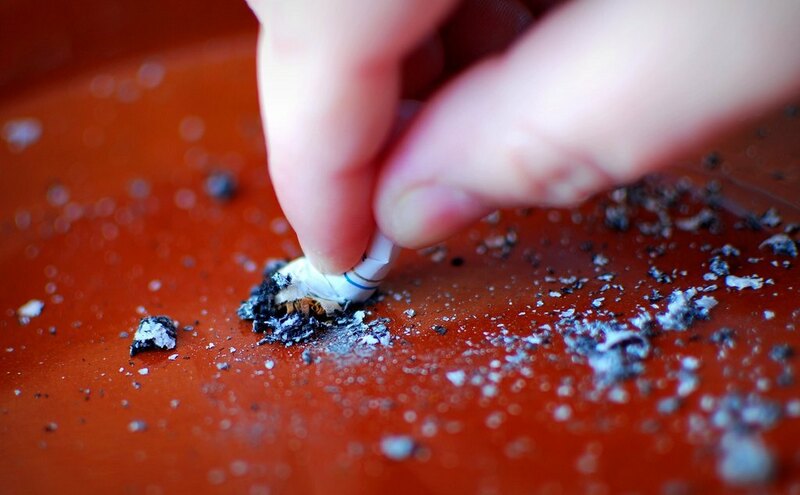 Another study found that the general quality of life is significantly improved after quitting smoking. There are several ways to help yourself while working toward your resolution to quit smoking. A study conducted at the University of Haifa found that omega-3 supplements can be beneficial when quitting smoking. People who smoked and took omega-3 supplements had a lessened desire for nicotine. As a result, they smoked less, even though they weren’t consciously trying to reduce their smoking. This is likely because one of the damaging side effects of smoking is a deficiency of omega-3 fatty acids in the brain. Because omega-3 fatty acids are involved in the part of the brain related to decision making, rewards, and addiction, an omega-3 fatty acid deficiency makes it very difficult for smokers to resist the urge to smoke. Omega-3 imbalances are also associated with an inability to cope with pressure and stress, so correcting an omega-3 deficiency can make it easier to deal with the stress that often drives people to smoke. Omega-3 supplements are also easily available and low risk, although it’s still a good idea to let your physician know before starting any new supplements. Small financial incentives can also help when trying to quit smoking. Researchers at the University of Texas Health Science Center at Houston found that by offering gift cards in slowly-increasing increments, the quit rate at a smoking cessation center doubled. Compared to the cost of medical treatment for the health issues caused by smoking, the total gift cards given for quitting smoking saved thousands of dollars. While this program isn’t in other clinics yet, it’s something to keep in mind if you’re trying to quit. Instead of buying cigarettes, you could buy a few gift cards to entrust to a friend or family member, so that you earn them back the longer you go without smoking. The resolution to quit smoking is a big one, so get your loved ones involved to give yourself a head start. By learning about techniques to quit smoking, friends and family can encourage you. Even printed literature, such as pamphlets and printed information, can help educate your loved ones. This may give them a better understanding of the struggle involved in quitting, as well as the ability to suggest techniques to stick with your resolution. Self-expanding activities with your spouse or partner may also help you quit smoking. These include puzzle-solving, games, or hobbies. In fact, a study involving brain imaging found that self-expanding activities activate the reward region of the brain, which is associated with addictions like smoking. In other words, self-expanding activities stimulate the same part of the brain as smoking. As a result, engaging in self-expanding activities might reduce the urge to smoke. Talk to your physician to help you with your resolution, too. It’s especially important to discuss any other conditions you have with your physician, particularly depression. An evidence review in The Cochrane Library found that by utilizing mood management interventions after quitting, former smokers can keep from smoking for longer. Psychosocial methods, such as counseling or exercise, were successful at helping smokers stop smoking for longer periods. Antidepressant medications were useful for those with a history of depression. Therefore, if you struggle with depression, or if you struggled in the past, let your physician know. Additionally, there are prescription medications to help you accomplish your resolution. Talk to your physician about whether or not any might be right for you. Some studies have shown that combining these prescription drugs might also be quite effective, so discuss this possibility with your physician if you’re having a particularly difficult time. What strategies will you use to stop smoking?